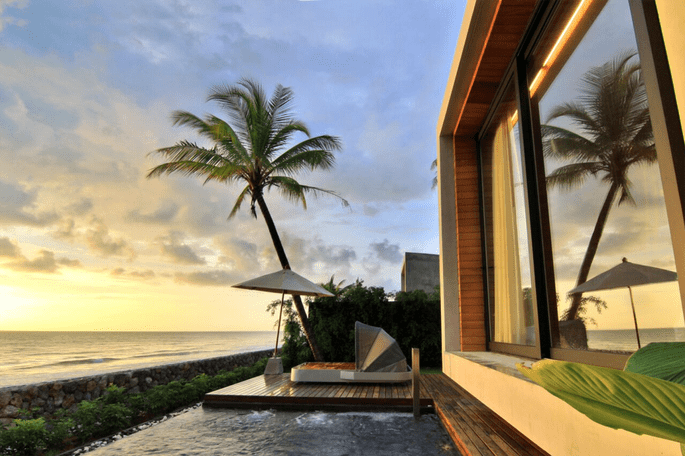 Top Thailand Honeymoon hotels: The perfect destination for a romantic getaway! For a throughly romantic and indulgent honeymoon experience the chic side of Thailand, check out these our 14 favourite honeymoon hotspots! Discover the totally tropical honeymoon paradise that is Thailand. You may associate this escape with backpackers but trust us when we say there’s no chance of stumbling upon a ‘full moon’ party, and you will absolutely love spending your first days as a married couple experiencing the chic side of Thailand. Check out our pick of the truly special places to stay, each with it’s amazing atmosphere and postcard perfect beaches. No matter which one you choose to go with, you can be sure of a thoroughly romantic and indulgent honeymoon. This is a breathtaking boutique resort built in a contemporary Thai style, nestled in a tropical garden the perfect place to indulge and delight in the natural beauty that is Kanchanaburi. It’s less than three hours from Bangkok and offers a truly serene and tranquil haven near the Bridge on the River Kwai. You’ll definitely fall in love all over again at this romantic location resort. 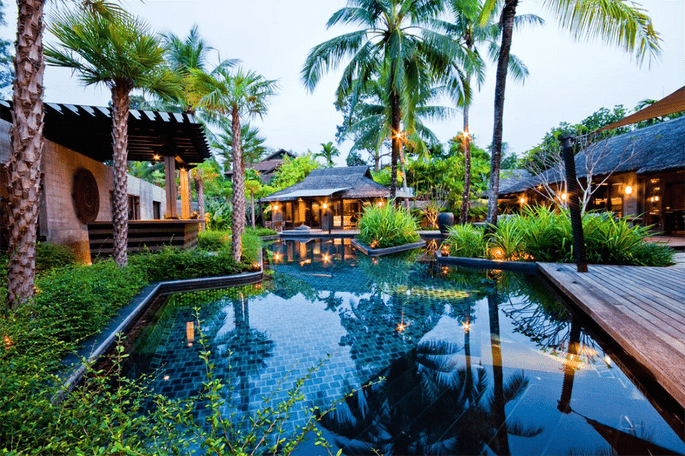 Prana Resort Koh Samui is an idyllic Thai sanctuary where traditional charm co-exists with modern comfort. Honeymoon here and you’ll be able to bask in nature’s beauty while rejuvenating both the body and the mind. 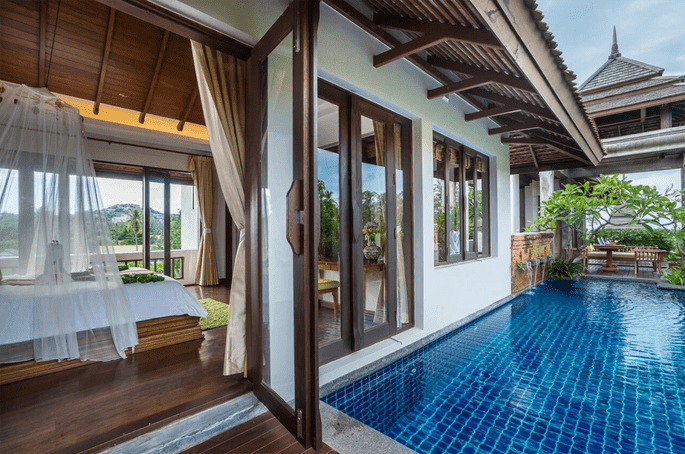 Inspired by the Thai fishing basket called kwhaang, Prana Resort Koh Samui is architecturally conceptualised to infuse traditional Thai craftsmanship with modern interiors, creating an environment ideal for romance and relaxation. 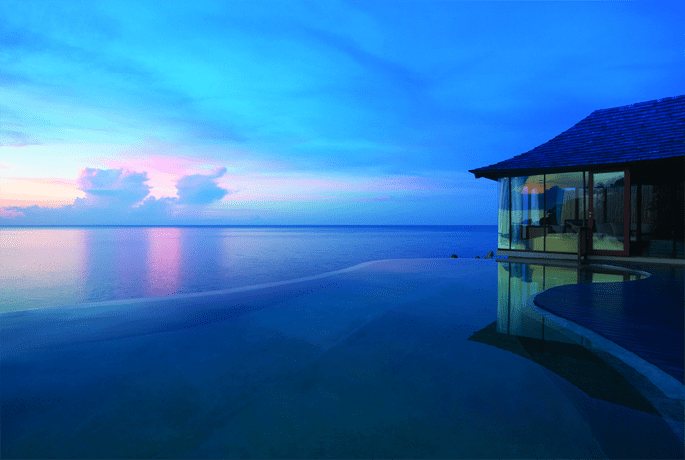 Soak in the sunset at the poolside whilst sipping on cocktails for pure bliss. We absolutely love the restaurant which serves spectacular food and has tremendously romantic views. 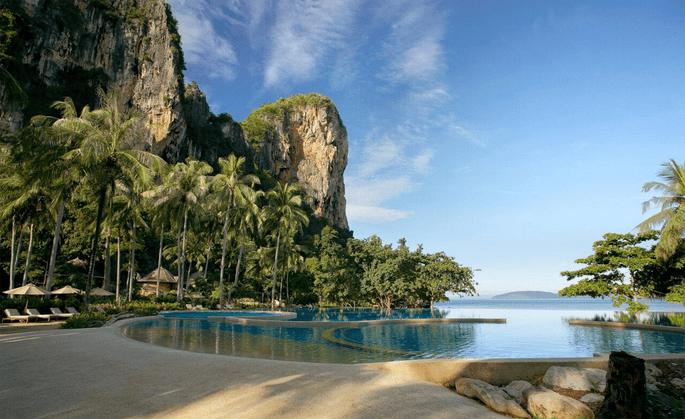 Rayavadee’s setting on the edge of Krabi’s National Marine Park at the heart of the stunning Phranang Peninsula, perfectly blends lush foliage, limestone cliffs, white sand beaches and the emerald waters of the Andaman Sea. 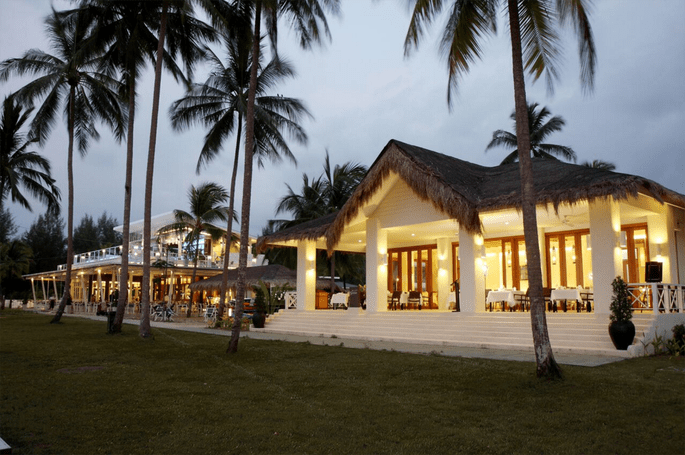 The resort’s 96 two-storey pavilions and 5 luxurious, beachfront villas are dotted throughout tropical gardens and coconut groves which give you a deep sense of relaxation in luxuriously private surroundings with mod cons to cater for modern travelistas. 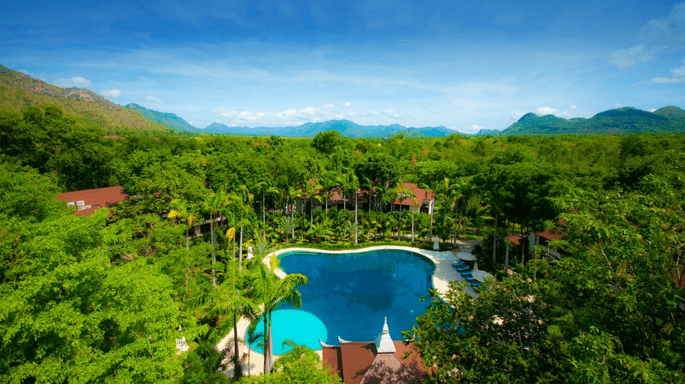 This is a truly extraordinary resort which offers some fabulous activities including our fave Thai cooking classes, flower garland making and learning the art of traditional Thai fruit carving. Soneva Kiri Resort comprises 35 vast pool villas on beach level, hillsides or cliff tops, all overlooking the Gulf of Thailand. Each of them have impossibly chic furnishings, personal electric buggies and impeccable service courtesy of Mr./Ms. Friday private butlers. And thats not all we were blown away by. The highlights of this sanctuary are like a dream come true including an open-air Cinema Paradiso, a home-made chocolate and ice cream parlour, a high-tech observatory and a spectacular Treetop Dining Pod. Need we say more? Silavadee is aptly named, meaning “beautiful rock” in Thai. It’s an exclusive luxury hideaway resort on Koh Samui which is located on Laem Nan Beach, between Chaweng and Lamai beach, where the most beautiful amazing rocks lie. 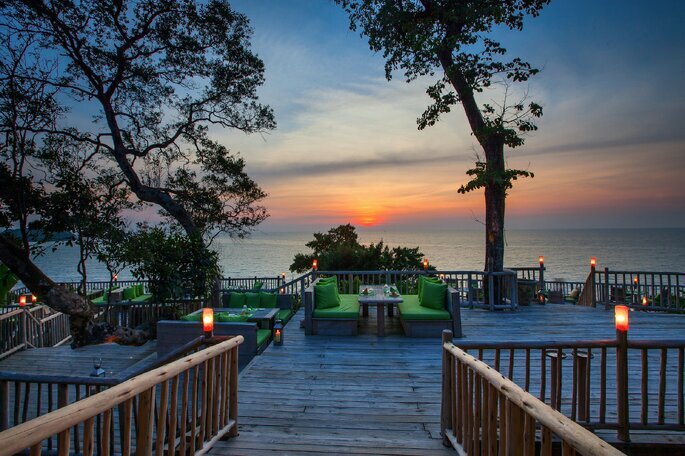 Silavadee is located on the secluded hill, overlooking the Gulf of Siam at the South East coast of the island. This place has the perfect blend of luxe and a back to nature vibe. So if panoramic sea views and beautiful design is your thing all you need is your case full of swimwear complete your dream honeymoon. At this amazing beachfront hotspot, cookery classes and snorkelling on coral reefs are all part of the experience. What’s more, honeymooners can be sure of royal treatment in this idyllic resort complete with powdery white sand and divine views. Thai tradition and charming hospitality really set this place apart. So if it’s peaceful rejuvenation you are looking for after all your planning efforts, this will tick every box on your honeymoon checklist. 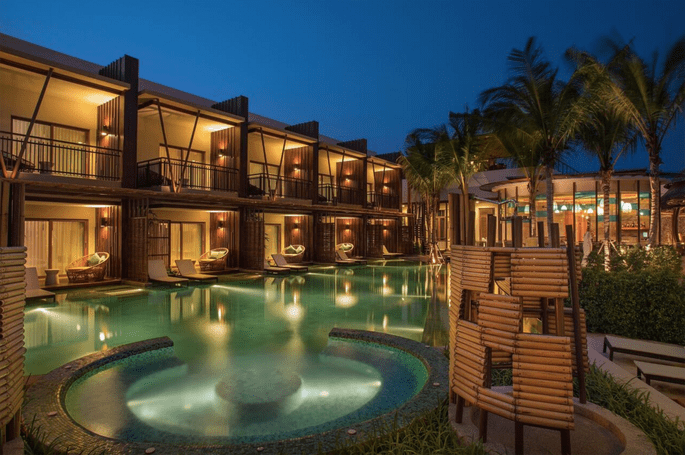 Located between Hua Hin and Cha-Am city, just 2 hours drive from Bangkok and only 15 minutes to downtown Hua Hin, Mida De Sea Hua Hin is a 4-star comfort and modern beach resort to celebrate your marriage. The contemporary architecture blends traditional comfort with modern materials, to create a classy, attractive and comfortable living environment. We absolutely adore the rooftop lounge, which serves all of your favourite beverages and snacks, and makes a perfect location to relax and take in the fabulous sunsets of Hua Hin. For the eco honeymooners, Aleenta Phuket Resort & Spa in Phang Nga is ideal being renowned for its passion for the environment. 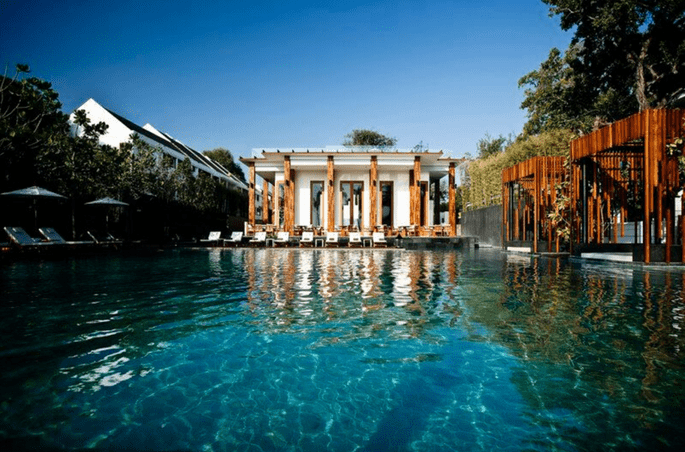 It was recently awarded the status of Thailand’s Best Small Green Resort. Natai Beach has also been awarded 5 Stars for the cleanliness of the beach and the water quality. Get pampered and experience Ayurah, the ′Epicurean Spa′ from the AHMS Collection, where the mantra is very much ″Eat Well, Live Well, Be Well, Look Good″ a philosophy which shines through in their treatments and the services they offer. Luxury of space, coupled with personalised services and professional staff, are the key reasons to choose Aleenta Phuket Resort & Spa in Phang Nga. The concept of “all suites, all private” is delivered in luxury rooms which come with plenty of private space. The Cape Nidhra Hotel, Hua Hin is in the heart of picturesque seaside town of Hua Hin, directly on the beautiful Hua Hin Beach. With a fab fitness centre and a Spa which has a variety of authentic massages and exotic head to toe treatments, there’s no danger of running out of things to do. The hotel offers easy access to the town’s charming street nightlife. Plus just look at the Rocks restaurant overlooking the huge saltwater pool! We know where we wanna be! Chill out in style at the Indigo Pearl which is located a mere 10 mins from the airport on Phuket’s secluded northern shore, situated within its own tropical gardens where lush lagoons juxtapose post-modern art. A Bill Bensley design masterpiece, the ‘all villa and suite’ property offers 177 accommodation choices, 8 restaurants and bars, 3 outdoor pools, beach club, art gallery, tennis courts, award-winning COQOON Spa and Thai cooking class. A host of leisure experiences both on land and sea can also be arranged. It’s raw beauty with bold designs and unhindered luxury. An experience as rare as an indigo pearl. Get away from it all at this modern and unique designer 5-star-resort. 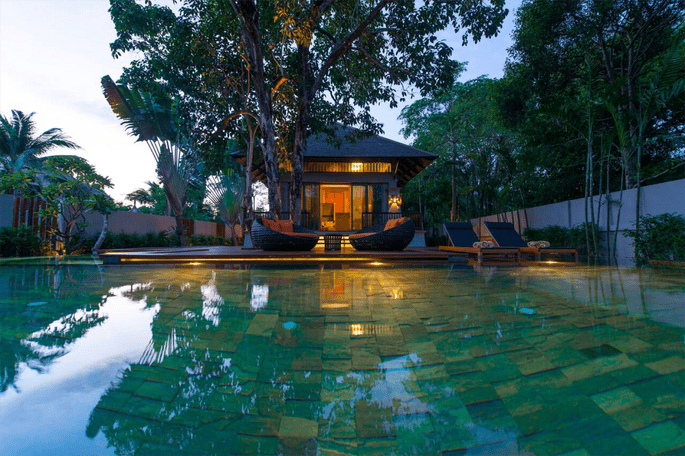 Located directly on the serenely beautiful Bang Niang beach of Khao Lak and close to the Khao Lak National Park, this haven ensures an intimate proximity to one of a kind tropical nature. Similan Islands and their world famous reefs are only a short, scenic boat ride away. The resort is perfect for your honeymoon guaranteeing absolute privacy with private pool. You’ll have an authentic and glamorous experience in any of the 36 gorgeous villas and suites, which combine concrete, wood and nature stone in a harmonious and intriguing way. 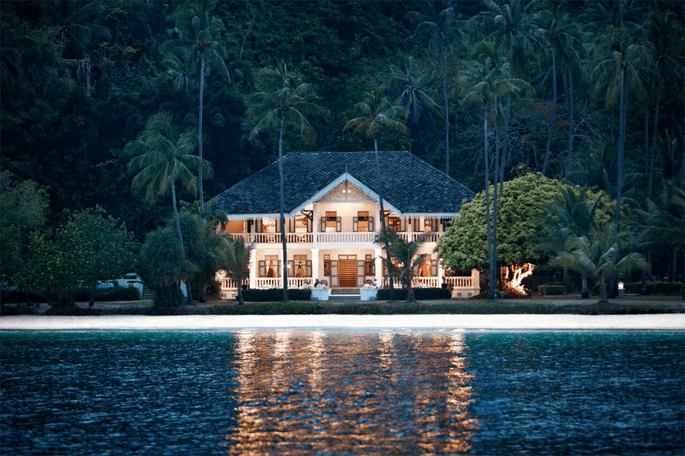 This place is simply gorgeous, built on an old coconut plantation on a hillside at the quiet southern tip of the east coast of Phuket Island. 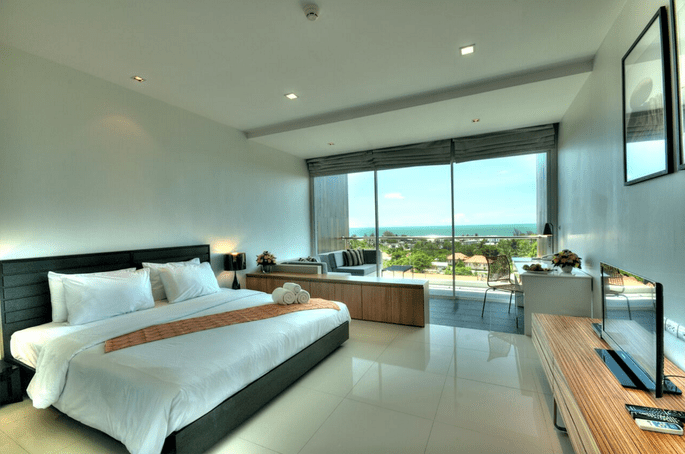 Here you’ll have panoramic views of the Andaman Sea and a secluded, palm-fringed white sand beach. It’s one of the last remaining truly tranquil spots on Phuket. Set in lush tropical gardens with a low-rise architectural design, Cape Panwa offers an attractive selection of 204 luxuriously appointed suites and villas, all sea-facing with large balconies and everything you expect and more from a modern five-star stay. Imagine a honeymoon in a sun-kissed paradise of golden sand lapped by the turquoise Andaman Sea; tucked away from the busy tourist spots of Phuket. Kantary Beach Hotel is a breathtakingly beautiful natural sanctuary located on one of the few remaining stretches of pristine beach in Phang Nga, just an hour’s drive north of Phuket International Airport. Featuring a winning combination of friendly and efficient service, top-of-the-range facilities, great accommodation and a truly beautiful location, Kantary Beach is a gorgeous refuge for real romance after your big day. Each of these jaw dropping, hot resorts allow you to see some incredible sights with the luxury of also opting for one toe in the pool and the other in the ocean. We are huge fans and believe you really can’t beat their great service and amazing food . So whether you are foodies, spa lovers, adventurers or happiest flopping on the beach, Thailand is the dream honeymoon destination to top off your unforgetable wedding day. For more options check out our top picks of the worlds best places to spend your precious first weeks as a married couple: How about Honeymoon Hotels in Zanzibar, The Best Bali Honeymoon Hotels, Top Honeymoon Hotels in Kenya, or the forever classic Hotel Hotspots in the Maldives? Before you start mentally packing your suitcase and booking in for your shots at the doctors, it’s probably best to take care of the rest of your wedding planning! You should be at the point where you are selecting your invitations so here’s a bit of inspo to help you out.